The Apple iPhone ‘Software Roadmap’ press conference has just finished at the Apple HQ in Cupertino, with Steve Jobs laying out the latest iPhone and iPod Touch updates, the features of the new software development kit (SDK) for third party developers and outlining the plans for the future of both devices. Additionally, Apple made some rather surprising announcements about the future of mobile phone gaming. Read on for the full update. First up, it’s strictly business, with push email, push calendar, push contacts, global address lists, Cisco IPsec VPN, considerably improved security, remote wipe, ActiveSync and Exchange support and lots more all introduced for the business user. Does this spell the end for BlackBerry’s dominance on the US business scene? TechRadar will bring you the response to this news from Research In Motion as soon as we get it. Apple’s new SDK will be launching this coming June and will give devs the same APIs and tools that Apple uses in-house to create iPhone apps. So we’ll have to wait till later in the summer until we see a slew of new iPhone applications and we cannot wait to see what creative third party developers will do with the location-aware features and the iPhone’s 3-way accelerometer. Apple will also launch an iPhone simulator which will run on OS X to make life a little easier for prospective developers, with a nominal cost of $99 to devs for publishing their applications and an additional 30% of revenue going to Apple to cover distribution costs via the newly announced ‘App Store’. "This is NOT a cellphone game. It's a console game, if anything, we underestimated what the iPhone was able to do from the start, we had to fly in another artist to scale up the art to match what the iPhone could actually output." As a little extra carrot for developers Apple announced the iFund - a joint initiative with investment company Kleiner Perkins Caufield & Byers (KPCB) to offer a total of $100 million (£50 million) for promising iPhone developers. "If you want to build the future, the iFund wants to help you fund it... 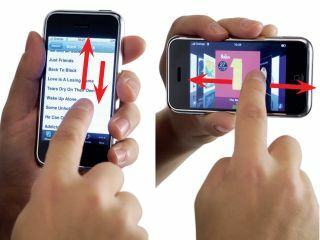 This is going to help young developers with funding, it will help the whole iPhone ecosystem," said Steve Jobs. Finally, in a Q/A session at the end of the presentation Jobs mentioned that voice over IP (VoIP) applications on iPhone would only work over Wi-Fi networks and not GSM or EDGE networks, presumably to protect the revenue streams from Apple’s lucrative partnership deals with mobile operators. TechRadar will be speaking to Skype and other VoIP companies in the coming days to gauge their response to this news from Apple. All in all, a great day for Apple and a great day for iPhone users and prospective developers. Stay tuned over the coming days and weeks for further in-depth analysis, features and news updates on everything iPhone.